Injinji Compression Sock Review + Giveaway! Ed Note: It’s Holiday Spirit Week here at Rock Creek Runner, and we’re celebrating with two awesome giveaways to help you kick-start your training in the new year. Today we’re giving away 5 pairs of Injinji Compression Socks and Thursday we’ll post details on a nutrition giveaway, featuring hydration gear, Nuun products, and Bearded Brothers bars. Don’t be a Grinch, and be sure to check back! It’s no secret that I’m a fan of Injinji toe socks. In fact, I’ve been wearing them almost exclusively during long runs for the past several months. I get more blisters than any runner I’ve ever met, but the toe socks have helped. A lot. But it wasn’t until Injinji offered to send me a test pair of their compression socks that I even considered giving the knee high version of their funky toe socks a try. I’d never given any sort of compression sock or sleeve a second thought. I didn’t really understand what the compression did, and thought they looked a little hokey. Never one to turn down an easy chance at improving my training, once they were offered, I gave them a shot. What’s The Deal With Compression, Anyway? As I’ve come to find out there isn’t a whole lot of definitive research that says compression makes you a faster runner. Or that it assists in quicker recovery. But runners don’t need definitive research to be convinced. They just need to try it. Reduces Calf Vibration: Every time your foot strikes the ground, it sends a vibration up your leg. This vibration is known to cause that terrible delayed muscle soreness, and keeps us wobbling for days after a big race. Compression around the calves reduces that vibration, keeping your legs fresher. Increases Blood Flow: The compression acts to squeeze the blood through your veins at a quicker rate, clearing out all the byproducts that build up in your blood causing fatigue. This is thought to help during the run, but especially during post-run recovery. Reduces Swelling: Any endurance runner knows that after a long run, your feet, ankles, and lower legs are often swollen and sore. Compression during the hour or so after the run reduces swelling by increasing the blood flow. When I first put on my pair of blue Injinji Compression Socks, Mrs. RCR ask if I was headed out to play soccer instead of going for a run. And I was OK with that. Soccer players are cool. That day I took off on what would be my first 20 mile run in the socks. Since then I’ve run 6 15+ mile runs in the socks, along with 3 of my 6 legs of Ragnar DC. During each run, I’ve been amazed at how fresh my legs feel. What I’ve used them for most is recovery. I throw them on immediately after my shower for about 30-45 minutes to help reduce swelling and increase blood flow around the feet, ankles, and calves. I don’t need the studies, I can tell you from experience that it works. Compression sleeves stop above the ankle. This means that the foot receives none of the compression, leaving the ankles and feet without assistance. The 5-toe design reduces moisture in the foot, prevents rubbing between the toes, and reduces the chance of blisters. If you’re going to wear a compression sock, you might as well wear one that makes the whole foot comfortable, not just the calf. If you’re already an Injinji fan, and you’re looking for compression socks, these should be a no-brainer. If you haven’t given the toe-socks a try, I promise you won’t regret it. Now for the fun part. It’s Holiday Spirit week on Rock Creek Runner, and we’re kicking it off with a giveaway of not one, but 5 pairs of compression socks (winners select the size). That means 5 lucky people will be armed with compression for the new year. I’ve set it up so everyone has the opportunity to get as many as 8 entries into the giveaway. You don’t need to complete all of the options to be entered into the giveaway, but the more you complete, the more chances you have of being drawn. Think Hunger Games where some people have a greater chance than others, only if you are selected, you get a sweet pair of compression socks and you don’t have to face a near certain death. This contest will end Thursday, December 5th at 11:59pm ET, giving you plenty of time to enter both this giveaway and Thursday’s Holiday Spirit giveaway. I’ll update this post with winners on Friday. Huge thanks to Injinji for sponsoring this giveaway and supplying the socks. Happy Holiday Spirit Week, and may the odds be ever in your favor. Abby, Jacob, Priya, Rob, and Patrick! I’ve emailed you all with further details. Note From Doug: While Injinji did supply these socks giveaway, the views above are completely my own. Injinji did not review the post or require any praise when offering the giveaway socks. I just really like them. oh how i love injinjis! awesome contest. Love the blog and hope to run trails with you at some point during my many work trips to DC! Ooooooh, I want these! I am a new convert to Injinji (no blisters! no dirt or grit between my toes!) and have been considering compression socks – so this is a match made in heaven! 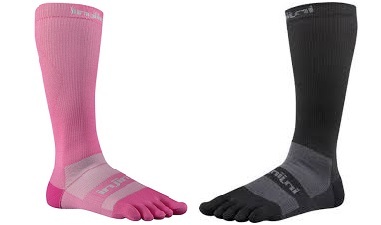 I’ve been intrigued by Injinji socks, but have somewhat long toes; would these work? I’ve been intrigued by compression socks for awhile, but there are so many brands/options I haven’t known where to start. Thanks for the info! I have just started using compression socks and love them already…I’d LOVE to try a pair on Injinji Compression socks! Thanks for the chance to win some Injinji socks. My legs need some compression. My toes would loves some new socks! Every now and then my pinkie toe starts digging in to the next toe, just for fun. I volunteer to the be a tribune! I’ve been meaning to give these a try! 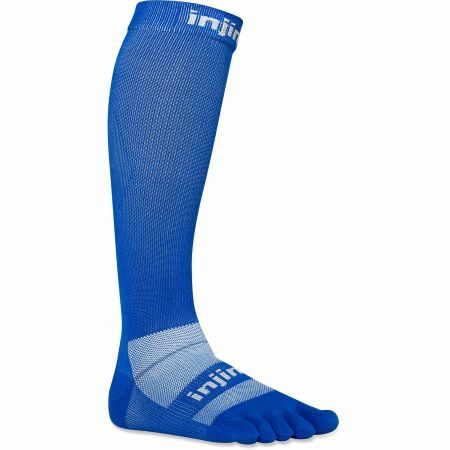 I once owned a pair of the original Injinji compression socks, when I was just starting to use compression socks in general, and didn’t like how they fit/compressed. But I’ve heard really good things about the version 2.0! Looks like these are the ‘Reese’s Pieces’ of socks—two great things combined into one! Ha! The best kind of combination. I love my sleeves (and then I wear compression socks as well), but I’ve been curious about these! Sweet giveaway – pretty much only run in Injinji, but never tried compression socks. Now training for my first marathon, I think I may need to give them a whirl. Pick me, pick me, pick me. Pleeeeaaaassssseee. These sound cool! Pick me! Just finished my first ultra wearing a pair of Injinji socks and did so without a single blister! The compression would have been a nice bonus. compression toe socks?!? let’s rock it! Ok, I just blogged about the possibility of moving onto trail runs, and being a DC runner myself, I’m interested. Never tried compression socks OR toe socks, so Injinji seems like a good fit for me. If nothing else, it will be my new stocking this season! Ditch my sleeves for these? In a heartbeat. Never tried compression socks but I would love to give them a shot! Have always wanted to try these out. Injinji socks are pretty great. I’ve never tried the compression socks, but have a few of the toe socks. I was worried they wouldn’t fit my longish peanut toes, but they’re great. The toe socks really helped with preventing blisters between my toes. Sounds like something I would try after I run Rock and Roll DC marathon in March!